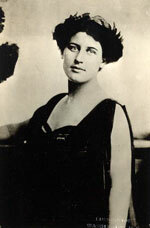 “Inez Milholland has this day finished a work for her sisters that will not be forgotten” (2). A room full of young, progressive, feminist women and not a single person recognized her name. Her “work” was embodying all that it meant to be a new woman, the core of which was suffrage. In 1916, Inez Milholland died for the cause, leaving behind the legacy of a warrior who gave herself completely to the most important battle: equality for women. Now, generations after her death, we, her American daughters, reap the benefits of her life and have no idea who sowed the field. Inez’s parents, John and Jean placed great importance on social justice. “Because of her father’s interest in the underdog, our house was always full of leaders of unpopular causes”(3), Jean recalled. Jean required all her children to volunteer and help the needy through starting a branch of the International Sunshine Society (4). Jean also believed that suffrage was the most critical element of the “New Woman Movement” that was forming in the United States as Inez came of age in London (5). Inez became the embodiment of a New Woman, and the battle for which she gave her life was suffrage. A central aspect to the New Woman movement was sexual empowerment, an idea that was, in many ways, more threatening to men than were votes for women (6). Inez was known for her beauty and sexuality, which she used to further the suffrage cause, proving a woman could be both a strong warrior and strikingly beautiful. She and her husband, Eugen Boissevain, had an open relationship, throughout which Inez continued to exercise her sexual prowess. 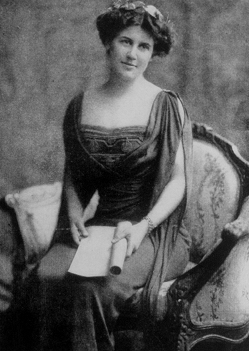 However, Inez clearly saw the dangers of sexual exploitation and worked against prostitution saying, “We can never solve the problems of prostitution until woman has become the economic and political equal of man” (7). In the spring of 1913, Alice Paul recruited Inez to lead the suffrage parade she scheduled for the day of Wilson’s inauguration. 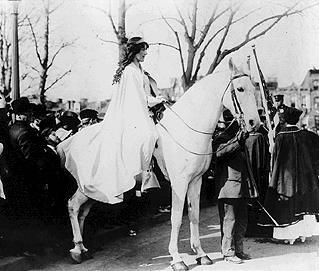 Inez rode a white horse, and dressed in honor of her hero, Joan of Arc, which made her look “every inch the herald of a great movement” (8). The parade demonstrated increasing physical freedom for women, which the Star recognized, describing the parade as a “battlefield captured by Amazons” (9). Although the parade’s participants met hateful jeering from drunken onlookers, those who awaited its end loudly cheered their hero as Inez came riding by on her horse. Following the parade, Inez was fearless in all of her work. She became a champion for the female underdog, providing pro bono legal advice to women. Her solution to the exploitation of female retail workers was to unionize, and she organized successful boycotts of upscale New York retail stores as she uncovered and wrote about the abuses suffered by female workers (10). She was also the first woman allowed to meet with male prisoners alone, when she helped uncover a graft scandal at Sing Sing prison in Ossining. “She talked with men; she unearthed appalling conditions; but she did not flinch” (11). And, when World War I broke out in 1914, she went to the front lines in Italy as a reporter, and called for global suffrage as a tool to end the war (12). In 1916, Inez agreed to be the keynote speaker in the western pro-suffrage tour organized by Alice Paul. There were usually between one and two thousand people who attended Inez’s speeches, which centered on the power of uniting women. In one speech, she proclaimed, “This is the time to demonstrate our sisterhood, our spirit, our blithe courage, and our will. It is women for women now, and shall be till this fight is won. Our mission is of almost sacred importance. We come to do what has never been done in the world before” (13). Though she hid her illness, the grueling traveling and speaking schedule exacerbated her pernicious anemia, and she collapsed in October 1916 during her last public appearance. Inez was carried from the stage, but fifteen minutes later she returned, took a seat, finished her speech, and stayed for a question and answer session. That night she went into the hospital, and died six weeks later. Inez’s last sentence before her collapse became a battle cry for suffragists: “Mr. President, how long must women go on fighting for liberty?” (14). In addition, Alice Paul strategically turned Inez into a martyr and used her death as an example of how far women would go in their fight for suffrage, setting the stage for the “final, most militant phase of the suffrage movement” (15).